1. Recall that, at least according to the book mentioned by Veers in this post, the Nebula in question has been referred to as the Farragut behind the scenes. 2. Okuda has confirmed that the model was relabeled as the U.S.S. Leeds NCC-70352 for its appearance in the re-done opening credits at the beginning of DS9 Season Four. This is borne out by photos such as this one and this one. The thing that I noticed was that both reference shots of the Leeds, the only ones that I have ever seen, are of the model seen from below. This is also the angle from which the model was shot for the DS9 credits. So I was thinking: What if they only ever relabeled the underside, leaving the top (and perhaps nacelle pylons) labeled as the Farragut? I guess what I'd like to know is whether or not anyone has seen the model (or a photo of it) from above, or has otherwise identified Leeds signage anywhere but on the saucer underside. After a quick search, I have found some evidence for your claim. On Bernd's site, there are two pics of the Farragut model: this one, of the underside of the model but with no name or registry, and this one, from the same model yet with a name and registry labeled on the top of the saucer. Curiously, in the second Leeds pic you have a link to, there is a label underneath it saying "U.S.S. Phoenix (aka Farragut)." Very strange. So it may be that the Farragut never had a label on the underside, and without changing anything else, the Leeds was created adding the label there? And since it would have been boring to have a ship with just a number, it was decided to add the name to the underside too. Sounds reasonable. Regarding the sign on the exhibition, it may have been labeled "Phoenix" because the name was deemed more prominent than the class name, or because whoever made the label was not aware of the class name. But why "Farragut"? I have the impression that the model came in a box, upside up, and no one saw that it was the Leeds on the underside. I have uncovered evidence which invalidates my theory. 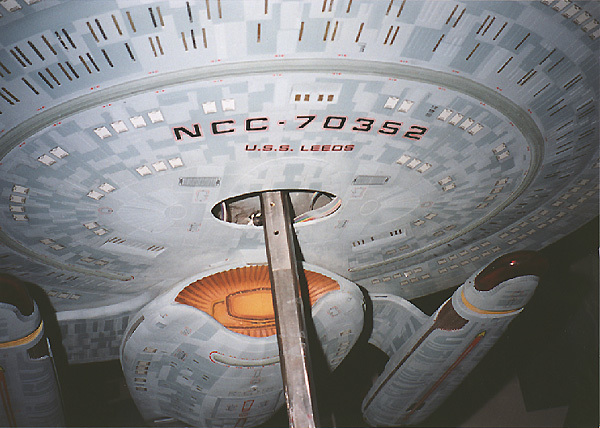 The pics here and here show the model with the Leeds' registry on both the nacelle pylons and aft pod pylon, where Farragut labels used to be. There is no shot showing the dorsal saucer surface, unfortunately, but I doubt that they would change all the labels *except* that one. More likely, the use of "the Farragut" is merely internal VFX company jargon, in line with David Stipes calling the Miranda "the Reliant" and the Galaxy "the [Enterprise] D" and such. 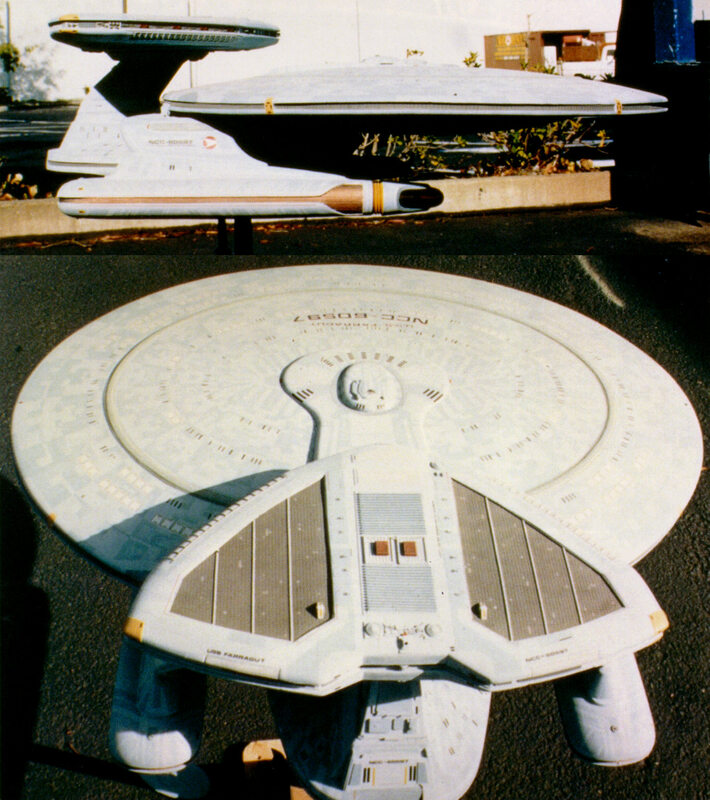 In this case, ILM had just extensively and prominently refurbished the model as the Farragut for the previous film, so it makes sense that they would use that designation. And perhaps this is all for the best, given that FC takes place after "...Nor the Battle to the Strong" (DS9), in which the Farragut was said to have been destroyed by the Klingons! So. . . we might as well just say that it was the Leeds at Sector 001? Not completely safely. After all, the ST:FC ship is only seen from the one angle where we don't know for sure that the pennants were changed - the dorsal side! But yeah, it seems likely that despite those references, there was no Farragut in ST:FC, merely a model of the "Farragut type" = Nebula class, and very probably labeled Leeds. I think we'd have to agree that since they'd bother to change the pennants for such a distant appearance when the original Farragut livery didn't show up onscreen in a much closer look, says they wouldn't leave the dorsal signage unchanged. And I'd like to hear opnions on Mim's question about what actually DOES appear on the ventral? Because I'm sure I've seen other ships with name and registry on the saucer underside. The Challenger in "Timeless?" Yes, the Challenger did have it, and most likely all the labeled CGI Galaxies and Nebulas. The USS Galaxy itself had both, as I recall. Nope. And neither did the Phoenix or the Prometheus, although the latter two were both the physical model. The Excalibur, Saratoga, Excelsior, Voyager, and Enterprise are all examples from other classes. The Leeds and the Challenger are actually the only two exceptions that I can think of off the top of my head. 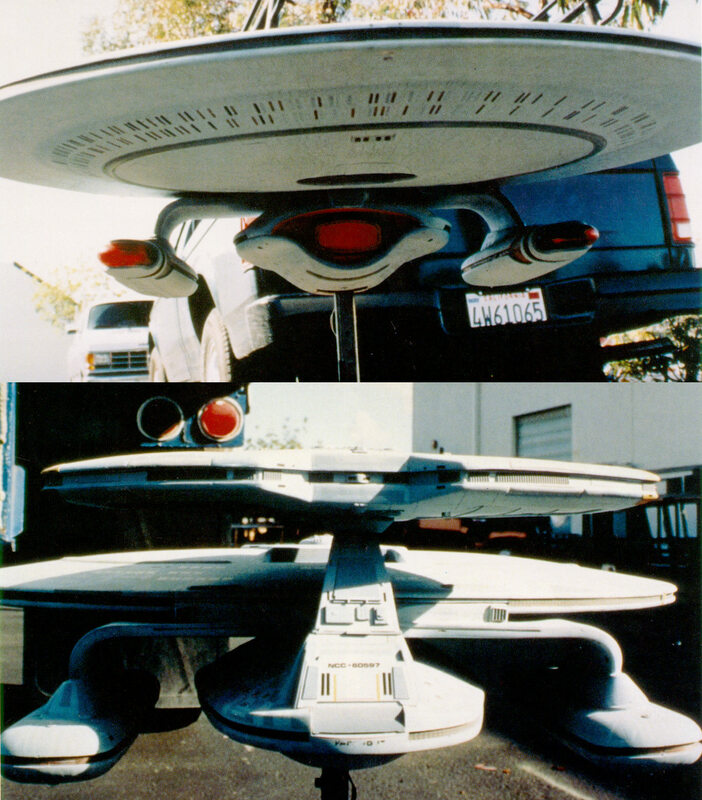 Although, the movie-era ships had names on the opposite side of their ventral saucers, facing aft. The Excelsior and Enterprise both have the ship's name on the ventral saucer- it's just behind the lower sensor (and facing the ship's hull for some reason). As superbly exemplified by that last image he linked to. Tha's what I meant....(hic! )...I'm shober offisher! Somehow I missed that second half of his post. I believe the USS Venture also sports the underside name near the registry.